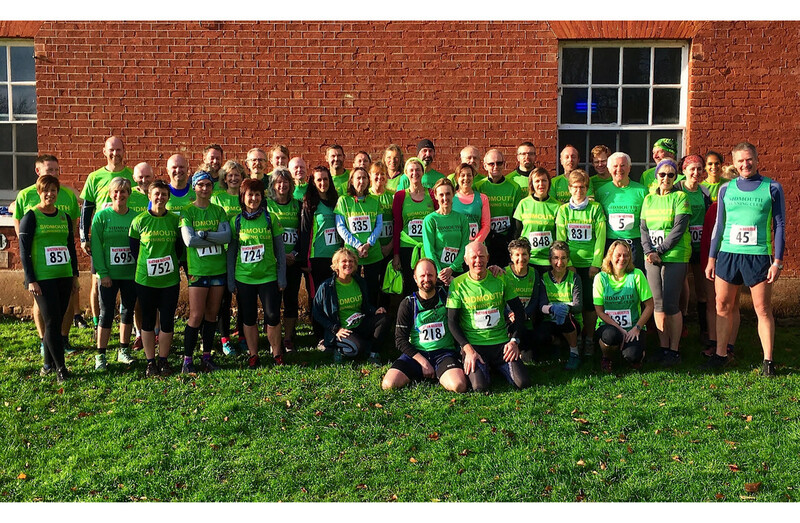 A very large contingent of the Sidmouth Running Club turned out for The Bicton Blister and Blister Lite. There were forty nine members in total. A fantastic sight, seeing that mass of Mighty Green poised to take on the challenge of the month over Woodbury Common. The Bicton Blister is organised by Exmouth Harriers Amateur Athletic Club. It starts at the very civilised time of 11am from The Bicton College. Heading out along a mile of country lanes, then up to the Woodbury Common, an area of outstanding natural beauty and rear pebble bed heathland. It mostly follows around the edge of the common and is an uphill run to the halfway point. This does of course mean that it is mostly a downhill run home. There are wide tracks with ruts and big pebbles, woodlands with narrow paths, a few damp areas and a stream to cross. It is a tough race to compete in, but very satisfying to complete. First female runner and first Sidmouth runner home was the unstoppable Kirsteen Welch. She felt it was lonely up at the front, so digging in very deep, she caught up and joined forces with three lads. She ran with them for most of the race as they were all keeping a very steady/fast pace. Only at the end did all four runners go for the extreme fast sprint mode. She came 17th over all in a very fast time of 1h:08m:36s. Kirsteen recored a her last mile at at incredible 5:46 minutes. Richard Summerhayes was only a minute and a half behind in 25th position and a time of 1h:10m:04s. Richard was the 1st Sidmouth male and 2nd Male V50 over the line. Jessica Raynor did well with a time of 1h:11m:34s crossing the line in 34th over all, 2nd Sidmouth lady and 2nd in age group. A steady stream of Mighty Greens now start to appear at the finish line with Jim Forrer in 73rd place, 1h:18m:10s, David Chipping 90th place in 1h:21m:05s, Nigel Maeer 107th in 1h:23:01s and rossing the line in 136th place was John Keast with a time of 1h:25m:48s. Martin Trueman grabbed 148th place in 1h:27m:03s, just 2 seconds ahead of Colin I’Anson in 149th position 1h:27m:05s. Not much behind, was Sam Ingram. He is already in preparation for the London Marathon next year. He felt pleased with this performance, especially as near the end he was suffering from cramp. He was quicker time than last year and is now looking forward to next years Blister and to beating this years timing of 1h:28m:32s and position of 164th. In 177th place was Catherine Hilton with a time of 1h:29m:49s and a 2nd female V45 place. This was the first time Kyle Baker has competed in the Blister and the first time he has taken on this distance competitively. He has been suffering knee issues and felt he had not trained enough. However, after the first few miles his pace quickened and he just dug in for the duration. He achieved a 201st place over all, in a time of 1h:32m:39s, beating Chris Day-Kerry by just six seconds. Chris Day-Kerry came 202nd in 1h:32m:45s having enjoyed the race, even though he didn’t quite catch Kyle. Simon Hollyer, Rachel Nice and Rob Edwards spent the race within each others sight only sorting themselves out with a last minute dash for the line. Simon came out on top with a 222nd position and a time of 1h:35m:06, then in 226th was Rachel with a time of 1h:35m:13s. Then Rob, who last competed in the Blister in 2015, was not far behind in 227th in 1h:35m:39s. Sarah Clapham arrived on the line in 236th place in 1h:36m:01s, just ahead of Graham Sheppard and Richard King, who both made a last minute dash for supremacy. Graham crossed the line ahead by a whisker, giving him 241st place in 1h:36m:56s and Richard 242nd in 1h:36m:59s. Then in 1h:38m:39s came a satisfied Tim Swarbrick with Steve Saunders 1h:39m:26 and Sue Cole 1h:39m33s also battling out the last few yards, Steve got 257th place and Sue the 259th. Don Cawthera, Deb Marriott and Christine Farnham kept each other going, enjoying the scenery, the company and the weather. All three respectively arriving in 275th, 276th and 278th places. Jo Earlam came in 312th place running a 1h:48m04s race knowing that the Sunday papers could be read later, with Carine Silver 323rd and Sarah Watkins 326th not far behind. Then Cathy Kelly 1h:51m:40s in 337th place with John Doherty 1h:52m55s getting a well earned 343rd position. This was the first time Els Laureys entered the Blister and she was determined to complete it within two hours. Deciding to take it at a steady pace of 11 minute miles all the way up to the water stop at Warren carpark she was close to her target, so with a down hill journey back to the finish her target time was looking good. There were some holdups with bottle necks of runners through the woodlands on the narrow twisting pathways, but Els battled on and managed to beat her target coming 345th in 1h:53m:15s. 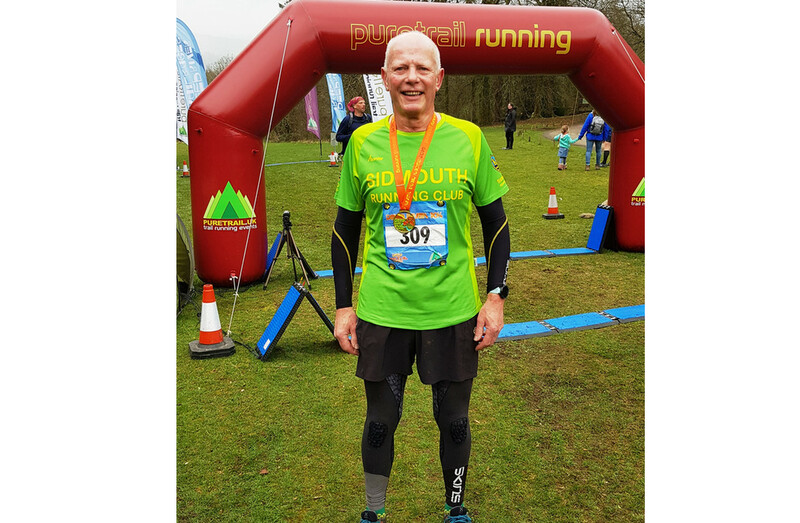 Terry Bewes who had been running with and encouraging Els followed in shortly after taking 346th place in 1h:53m:34s. 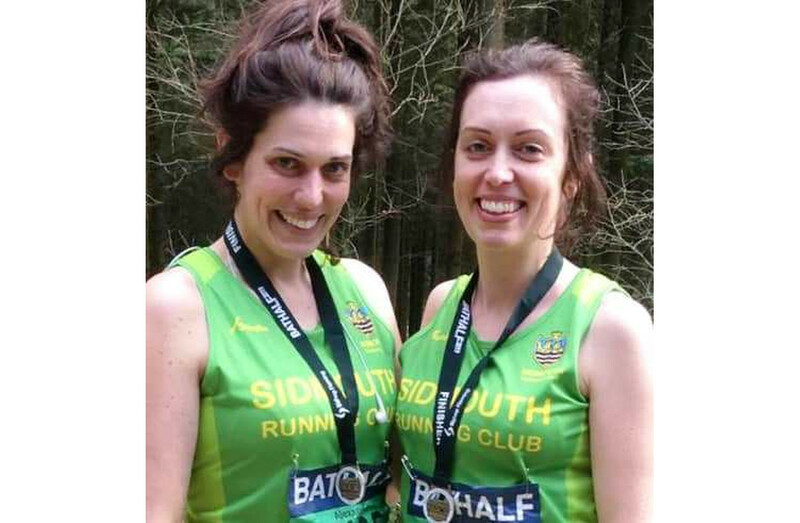 Two more Sidmouth runners made it back before the two hour mark, Jenifer Bentley 364th in 1h:55m:40s and Amelia Frankpitt 376th in 1h:57m:02. The Three Chatty Ladies who came in literally just after the two hour point having enjoyed the fresh air were, Kathy Keast in 385th place, Helen Palmer in 386th place and Monica Read in 387th. Following on from them were Christie Ward with running partner and Dad John Sharples. Both were spurred on by Terry Bewes and the enthusiastic sound of the bagpipes. Christie was pleased to have completed this tough run in 2h:01m:42s giving her the 393rd spot and John came 394th in 2h:02m:55s. Meanwhile the Blister Lite runners were finding the run a challenge and great fun, with what suspiciously looked like sociable groups being formed. The Lite runners set off with the Blister’s but take a short cut across the common. It is still a formidable route. 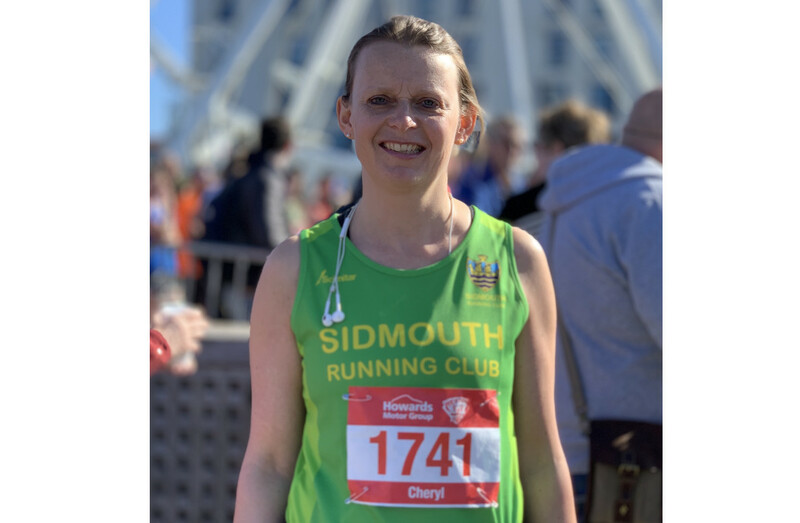 Kate Marriott was the first Sidmouth Lite over the line with a good time of 39m:34s and 12th place over all, with Sarah Ginsberg taking the 24th position in 45m:46s. The next four runners were all MG’s with Paula Farrand leading, followed in quick succession by Michael Ginsberg, Jane Hemsworth and Karen Farnham. Paula took 26th place in 46m:01s, Michael 27th in 46m:15s, with Jane 28th in 46m:25 and Karen 29th in 46m:27s. Usually Bert Dykema keeps up with running buddy Paula until the last half mile and then takes the turning to the carpark, rather than the finish line. However, today Bert ran straight to the line and grabbed the 40th place in a brilliant 50m:42s timing. Seven minutes later our last three Lite runners cheerfully arrived back with Julia Haddrell claiming 70th place in 57m:16s. Then David Skinner in 71st place, felt that due to the lack of training, his time this year was not as good as the previous. He still got back in a fast 57m:27s, which at least is under the hour. Emma Grainger was suffering a cold, so did very well getting around before the hour was up, just squeezing in over the line in 59m:11s to obtain the 77th place. With the number of SRC members running in this event, there must have been very few points at the end, on the finish line, that a Mighty Green runner was not in view.